Produced by Page, “Led Zeppelin I” was recorded over 36 hours in the studio and was released on January 12, 1969 – reaching No. 6 in the band’s native UK and No. 10 on the Billboard 200 while going on to sell more than 8 million copies in the US alone and launching one of the most legendary catalogs in rock history. Page’s original amp started out life as a Supro Coronado; after falling out of the back of the band’s van during an early pre-Zeppelin tour, the amp was restored and modified in significant ways that made the rocker realize that the sonic palette of the gear had changed to something new and unique. After being shrouded in mystery for more than 50 years, Page has decided to share this extraordinary amplifier with the world in a 2019 limited-edition series. The guitar icon worked closely with Mitch Colby and Perry Margouleff to recreate this legendary amp for the first time. “I had been impressed with the forensic analysis both Mitch and Perry had put into the research of the sonic reproduction of the original Supro amp to arrive at the Sundragon”, says Page. A limited edition of 50 Sundragon amps will be hand-built by Colby and signed by the Led Zeppelin guitarist; they will be available throughout 2019 and a standard model will follow later in the year. For more details on the project, visit sundragonamp.com. 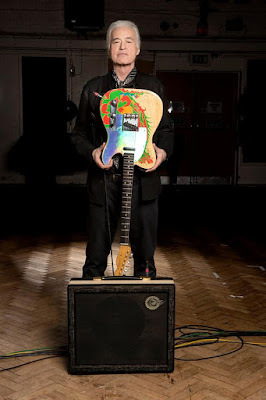 In addition to the amp, this month Page will release a limited-edition series of signature Telecaster models in partnership with Fender guitars; his iconic 1959 Telecaster – known for its two “mirror” and “dragon” designs – helped launch the rocker’s career in The Yardbirds and was used to record “Led Zeppelin I”, among other records.